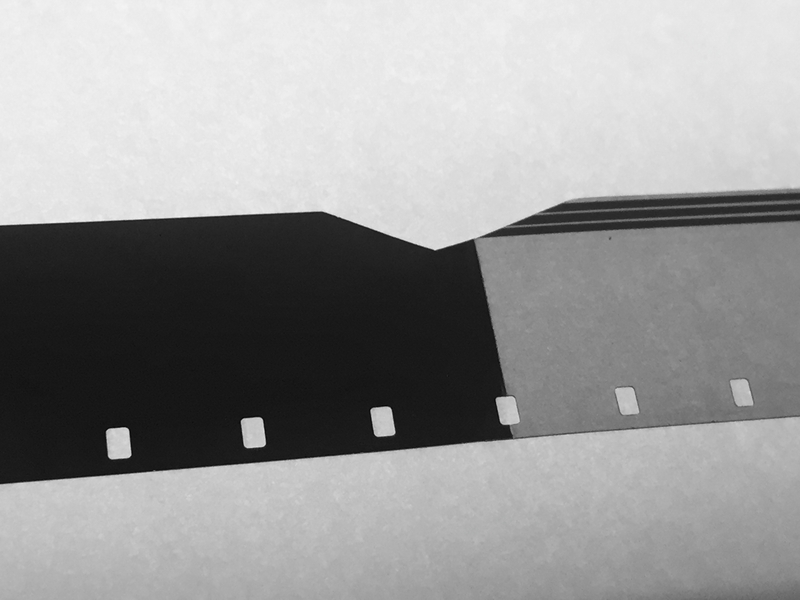 Film archiving, preservation, and experimental film (mostly). Fire of Waters (1965) is one of Stan Brakhage’s more elusive films, even though it enjoys quite a good reputation among those familiar with it. Its extremely striking, minimal, black and white imagery and very atypical and unusual use of sound make it fairly memorable, and yet it doesn’t seem to be as well recognized as one would expect. Brakhage would continue to make films for another four decades, but Fire of Waters is actually one of his final black and white films, followed only by Song 12 (also 1965 and generally printed on color stock) and the even more elusive Sluice (1978). The film’s overall comparatively spare minimalism prefigures some later works such as The Wold Shadow (1972) and Passage Through: A Ritual (1990), but it’s curiously out of step with the semi-maximalism of his other work of the early-mid ’60s (coming as it does right on the heels of Dog Star Man (1961-64)). It’s also a somewhat unexpected sound film right in the middle of the ’60s, coming three years after his previous sound work (Blue Moses) and two years before his next (Scenes from Under Childhood section one, the soundtrack for which would be almost completely superseded by a silent version). This background information is given to illuminate the approach and circumstance of the film’s making, but also to give some context for why it’s a fascinatingly atypical and quite striking work. Its soundtrack is no exception. Brakhage made only three sound films in the 1960s (a fourth, the lost 1962 film Silent Sound Sense Stars Subotnick and Sender, has been referenced as a sound film, but I haven’t yet encountered clear evidence that this was the case). To give some larger perspective – out of his full filmography of approximately 330 personal films (depending how you count), he only made 27 sound films in total. With very few exceptions, his sound filmmaking is mostly isolated to the first several years of his career (1952-57), and another batch from 1986-1992. A fair number of the 27 sound films have soundtracks made in collaboration with composer friends providing original or pre-existing music, such as James Tenney, Philip Corner, Rick Corrigan, and Joel Haertling. A few others feature soundtracks taken from existing recordings of composers who interested him, such as John Cage (In Between) and Carlos Chavez (Flesh of Morning). Only about 8 of the remaining sound films feature tracks made predominantly or fully by Brakhage himself: Desistfilm (1954), The Way to Shadow Garden (1954), Reflections on Black (1955), Daybreak and White Eye (1957), Blue Moses (1962), Fire of Waters (1965), Scenes From Under Childhood section one (1967), and The Stars are Beautiful (1974). Perhaps with the exception of Blue Moses and The Stars are Beautiful (two films oriented more specifically around literary content and language), Brakhage’s own original soundtracks tend radically toward the textural, often employing a highly dynamic collage approach contrasting quiet passages or near-silence with noisier ones, or discernible music and sound with highly distorted recorded material. In these films, sound is employed to invoke a nonfigurative, emotional reaction in tandem with its accompanying imagery. Desistfilm employs a hyper-noisy, fairly radical mash of textured, distorted material, including piano contributions from Tenney, while Daybreak and White Eye features one sequence in which loud vocal passages alternate repeatedly with meowing kittens. These original soundtracks of Brakhage’s, though employing contrasting dynamics, are usually made up of fairly continuous audio material which behaves structurally like a semi-typical soundtrack, however unusual their actual content may be. The soundtrack for Fire of Waters, though still dealing in texture and contrast, was approached in an altogether different manner. Indeed, over the course of its 6.5 minutes, the film features only these three short recorded sounds, occurring at the very beginning, end, and middle of the film. Here above is the original 1/4″ tape box for the Fire of Waters audio source material. 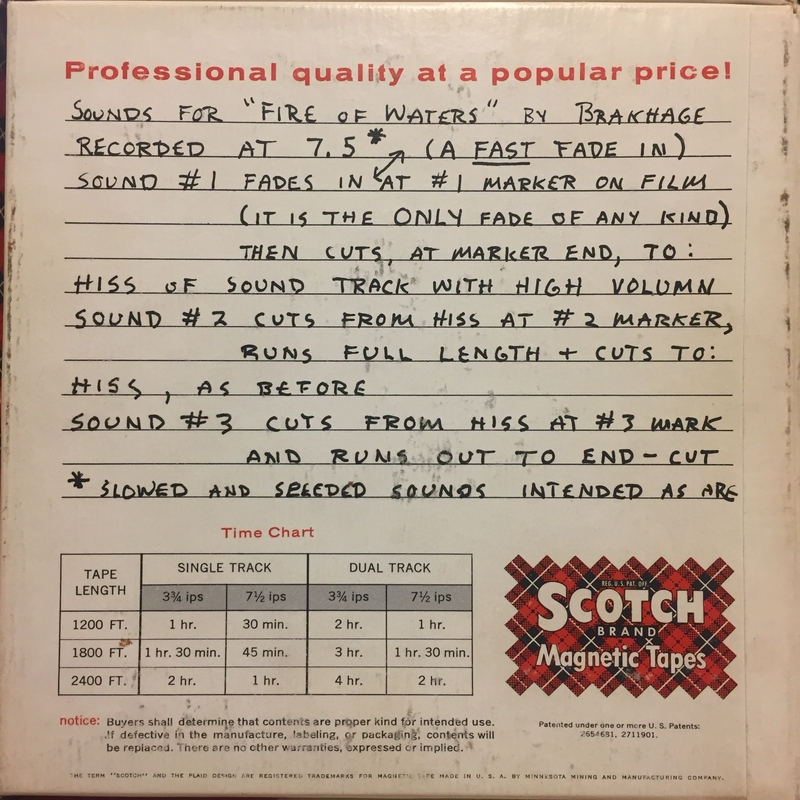 Labeled as “sounds for Fire of Waters“, it comprises only three very short lengths of 1/4” tape, not conformed to the film’s final edit, but just spliced to each other onto one reel, with a short length of leader between each. 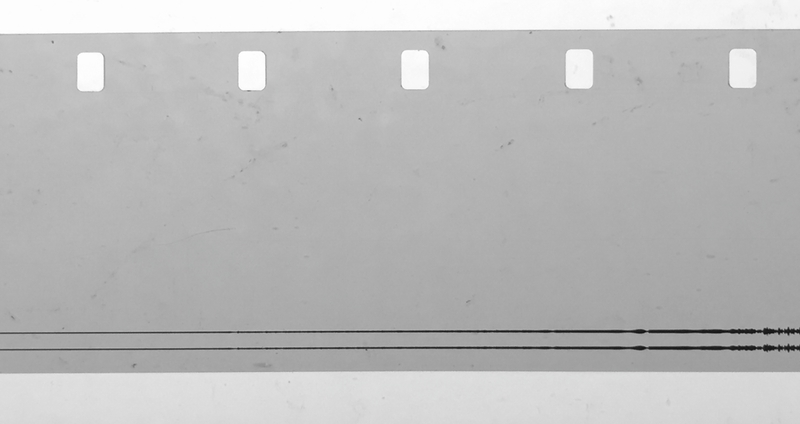 An archival aside here — when we transferred this tape in the course of the film’s preservation in 2016-17, it was done at 7.5ips (inches per second) as labeled, but Nick Bergh of Endpoint Audio described the content of the reel as follows: “…none of the three segments are the same tape head format. The first is a 1/4-track mono consumer head, the second is some odd off-set half-track with a ~20kHz ref tone on the very edge (maybe an industrial logging recorder at the wrong speed? ), and the last is full-track mono.” This of course confirms that the three pieces of sound also come from three totally disparate sources. In the title of this piece, I’ve used the phrase “sculpting in sound”, which was inspired by the way that Brakhage then constructed the final, conformed soundtrack for the film. 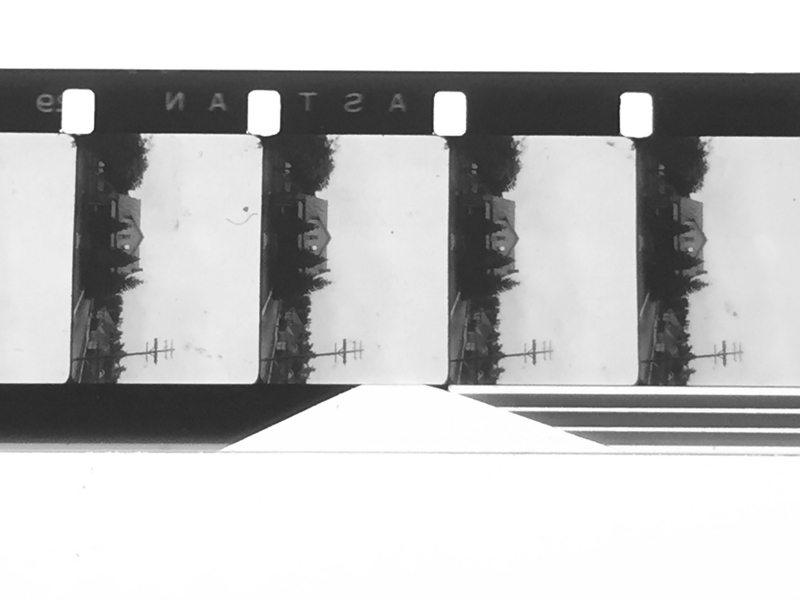 The short compiled reel of 1/4″ was transferred to 16mm optical soundtrack positive. Significantly, Brakhage didn’t just want these three short sequences of audio connected by silence. These three sounds are connected by a fourth variety of soundtrack material, which is “hiss of sound track” (as described by Brakhage on the box), and which he achieved through the use of clear 16mm leader. So these short lengths of recorded positive sound track material were edited into the film’s final 6.5 minute soundtrack, joined to each other by extended lengths of clear leader. Using clear leader in this manner would result in a soundtrack on prints that would reproduce a fairly pronounced hiss. 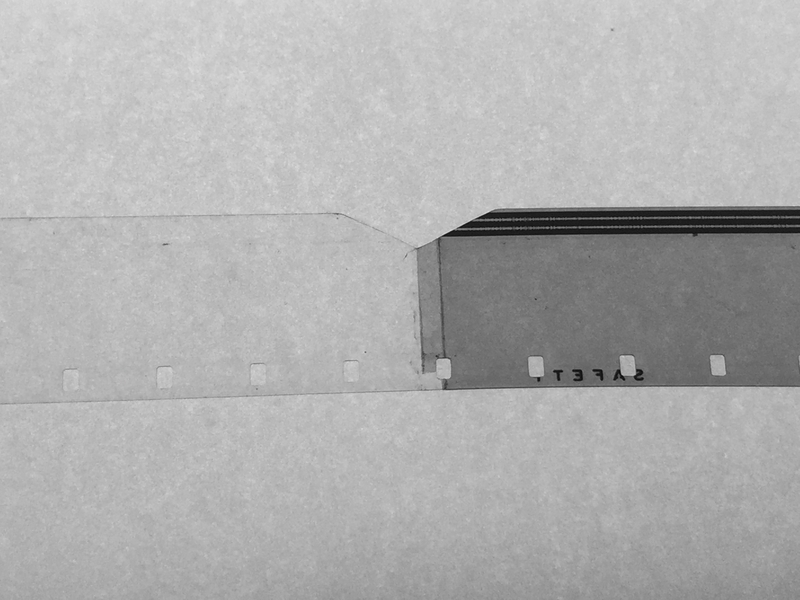 If the non-recorded portions of the track were black, light from the exciter bulb on the projector wouldn’t be able to reach the photocell, thus failing to reproduce any sound. But with a clear soundtrack during these sections, nearly the full illumination of the exciter lamp reaches the photocell, producing the hiss effect Brakhage wanted. 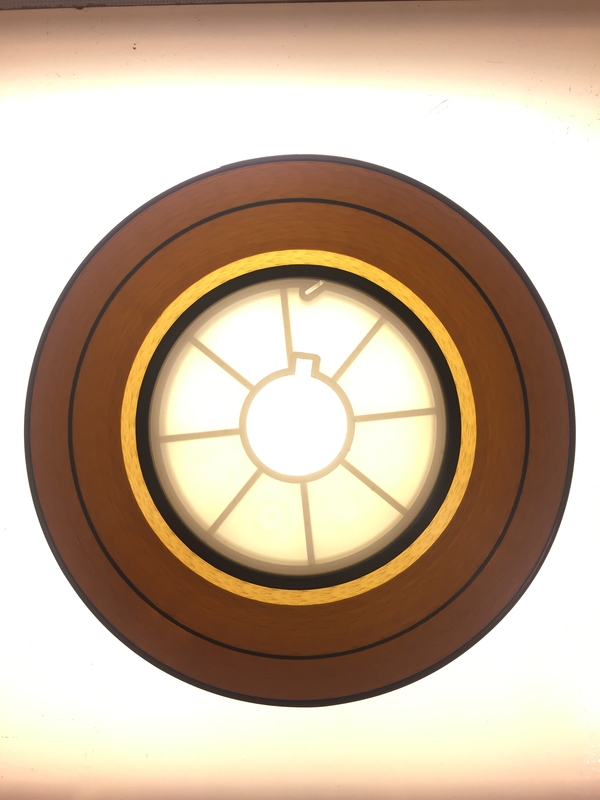 Here above is the original assembled positive optical track over a light box, with the short sequences of audio clearly visible as three periodic rings in the roll. The bloop, the V-shaped cut in the track at the splice, is a standard technique for softening (if not always fully hiding) the otherwise quite audible sound of a splice. I’m spending a lot of time talking about what is in some ways a very basic thing because I think there’s a significance to the manner in which the film’s soundtrack was made that should be known and considered in any critical analysis of Fire of Waters, not to mention as a reference point for any study of sound in experimental film. The soundtrack was sculpted very precisely and deliberately from a very small selection of specific elements, and its physical composition includes recorded and non-recorded sound (much more of the latter than the former). The non-recorded hiss is a direct result of the technological properties and behavior of the medium and its attendant machines. In this manner, the physicality of the medium is reaffirmed by this mode of sound-making, a process which is usually perceived as largely abstract to the viewer. Sound is understandably much less considered in terms of its filmic materiality than image is, even today. The use of clear leader in this film by Brakhage produces sound that is perceived by the audience as not just white-like noise, or hiss, but as the sound of film going through a projector. The sense of texture and presence that the clear leader provides in producing hiss even has unpredictable variability to it. Not only would each projector and sound system at each screening produce subtle variations on this elemental sound, but Brakhage would have of course been very aware of the inevitability that the clear portions of the track, vulnerable as they are to dirt, scratches, and other blemishes resulting from handling and projection, would gradually accumulate unique texture and noise over the course of the prints’ lifetimes. 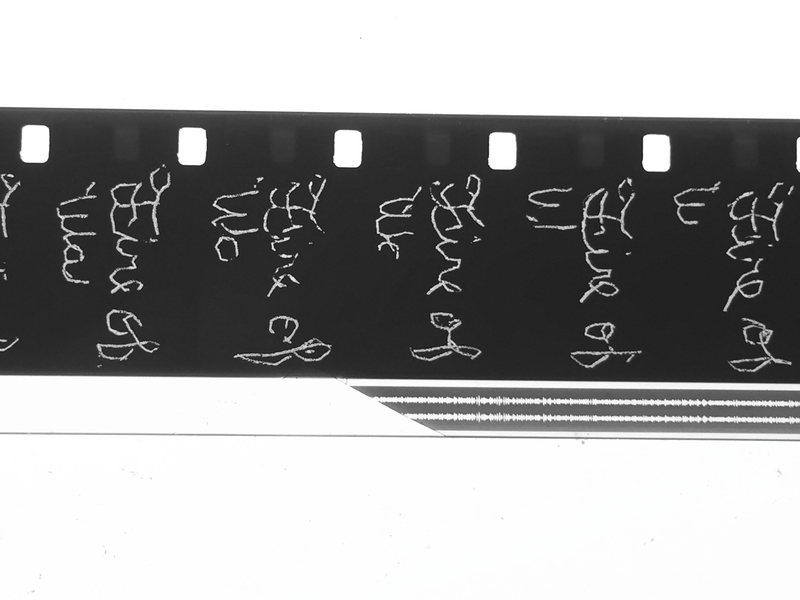 It’s additionally intriguing to consider that Brakhage worked on this film in the same year (1964) as some of the earliest presentations of Nam June Paik’s Zen for Film, a pioneering semi-conceptual work which comprised a looping length of 16mm clear leader run through a projector, “accumulating in time, dust and scratches” (Paik’s description) the longer it ran, though with a focus on image rather than sound. I don’t mean to claim that Brakhage was the first to employ this material approach to sound before anyone else, and haven’t done exhaustive enough research to even propose that. To start with, Peter Kubelka’s Schewachater (1958), though definitely quite different, feels like a forerunner of this awareness of an optical soundtrack’s materiality. Non-recorded graphical sound employed by artists like Norman McLaren seem to me an entirely different category, falling more into the realm of novelty and technique. John and James Whitney’s Five Film Exercises of approximately 1943-46 employ non-recorded synthetic optical tracks produced by the manipulation of a homemade pendulum device which selectively exposed the optical soundtrack, resulting in a quite textured noise floor to the audio content that the brothers apparently found interesting rather than problematic. Robert Breer would use Brakhage’s approach (though probably not due to specific influence) five years later in his film 70 (1970), saying about its soundtrack, “…I decided on a clear track, which, it turns out, picks up dirt and glitches, so that if you leave the audio on, there’s sound. I show 70 now with instructions to leave the projector sound on. There’s a breathing quality to the soundtrack, and it dispels the uncomfortableness of a nonsound film.” (quoted from A Critical Cinema 2 by Scott MacDonald). The deliberateness of this choice is telling, if any further confirmation were needed that the use of clear leader is not analogous to employing silence. What had been a segment of recorded audio physically cutting to clear leader in the original track was replaced by a continuous optical soundtrack comprising a recording of that material. Although such a track in a print of the film would still accumulate dirt and texture over multiple projections, its original intrinsically material qualities have been erased in favor of a de facto simulation of those qualities. Obviously it’s fair to suggest that I’m blowing these differences and their significance a bit out of proportion. But although so far I’ve purposely almost totally neglected talking about the archiving and preservation dimension to this film’s soundtrack, I think by now the complexities inherent to the film’s preservation should be somewhat explicit. If the film had only ever been printed from an assembled optical track like the original track positive, the argument for preserving the film’s audio in a similarly performative manner would be fairly compelling (see my previous piece on Robert Russett’s Neuron (1972)). But all prints made since around 1972 have been printed using the re-recorded track, which, though much more ordinary (and boring?) an element, still has a definite validity as well. Given the two states in which the optical sound for Fire of Waters has existed, neither truly has primacy over the other, even if my/our enthusiasm for the conceptual underpinnings of the original track positive make it seem somehow more significant or pure. Would recreating a “restored” optical track negative using Brakhage’s original assembly approach be valid? Is it too fetishistic, theatrical, romantic, dramatic? Does it risk changing the track in a way that would be ethically troubling or archivally inconsistent? Needing to do so in negative would mean using black leader instead of clear, to render a clear track image in the prints. Wouldn’t clean, unblemished black leader used in this manner differ from the clear leader Brakhage had used in 1965, which, no matter how new, would have probably had audible blemishes from the very beginning? Does just creating a new, continuous optical track negative re-perform Brakhage’s actions of 1972 which he could theoretically have done out of convenience or necessity more than artistic intention? As with a lot of questions of this nature, there’s no 100% unambiguously simple answer. The restoration of this film is a current project I’m working on (as of August 2017), so what have I decided? The 1/4″ tape was transferred, but to work from its audio would create a new track that differs too much in character and clarity from the previous optical tracks. So we transferred it and are archiving it for historical reference, but not actually using it in the restoration. The master source I used for the track’s restoration was the original edited track positive, which was transferred at Endpoint Audio as the 1/4″ tape had been. Over the years and after several printings throughout the ’60s and early ’70s, it picked up some wear and tear which is not necessarily consistently present in extant prints from the time. At Audio Mechanics in Burbank, I decided that we should digitally remove these instances of transient noise due to dirt and wear without in any way modifying the qualities of the clear leader hiss itself. This felt consistent with Brakhage’s original plan and intention, which was that the clear leader was meant to create hiss, and even if he was aware and potentially interested in the additional sounds from the gradual accumulation of more dirt in the film’s prints, this shouldn’t necessarily extend to the track master itself (and wouldn’t at all have been in character with Brakhage’s general approach as a filmmaker). I spoke with Marilyn Brakhage about all of this, and she agreed that reconstructing an edited optical track would be a little too performative and intrusive on the film’s historical integrity. But I nevertheless do want to preserve, in some way, this form of the assembled track, especially since I obviously consider it quite significant to the film, and even at least somewhat important in the larger context of the history of sound in experimental film. One option could certainly be to make a contact-printed photographic copy of the track positive, though I’m not sure this would yield a track of the same audio quality or personality, since it’s likely that distortion and another problems might be introduced in what is a fairly atypical process (striking a track negative from a track positive without re-recording). But at the very least, such a gesture would in a sense preserve the original track positive as an object and artifact representing a meaningful aspect of the film’s conception and making, not to mention an important detail pertaining to the working methods of an incredibly significant film artist. If nothing else, an awareness of the material construction of the film’s sound adds a meaningful dimension to the film, a revealing look at Brakhage’s approach to sound cinema, and an archival conundrum which has the potential to reframe how we might understand and approach other restoration questions of a similarly unusual nature. This blog post is extremely informative and interesting. I’d actually like to discuss with you further, as I believe this may be useful for my own research. The texts appearing on this site remain the property of their respective authors (Mark Toscano unless noted). Ownership/copyright of images may vary. Please don’t hesitate to reach me via the CONTACT page to inquire about re-use. Thanks! In NYC for @barbarahammer1 ‘s memorial Sunday, and what better way to prepare than to see an amazing Nancy Spero show at PS1?? I’ve talked to my CalArts History of Experimental Animation students about her works on paper in the past, but this was the first time I’ve been able to see a major show of her work. New York and NY-bound friends, definitely don’t miss this one!!! Working out some fine details on this restoration of Morgan Fisher’s Standard Gauge (1984). PRESERVATION INSANITY Create a free website or blog at WordPress.com.